Three of my friends are about to welcome baby number two into the world and it has me thinking about the idea of transitioning a child from a nursery to a big girl bedroom. Above, I put together a room with a little girl in mind. 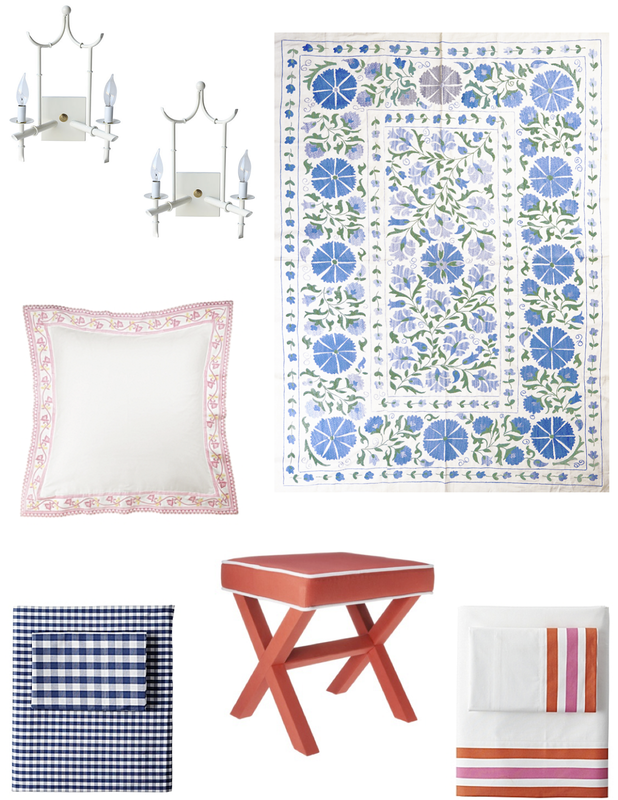 I incorporated a lot of pattern play with the bedding and love the suzani quilt paired with the blue gingham sheets. 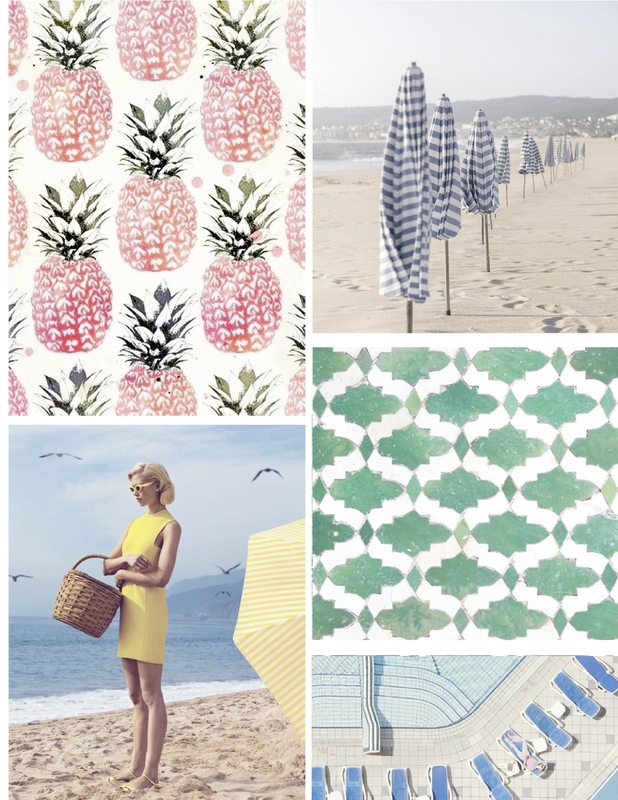 I also chose a playful striped set since you can probably never have too many sheets when kids are involved. I chose the timeless sconces as an investment piece then reigned it back in with the selection of the ratan chair and x benches (I would place one or two at the foot of the bed depending on whether you select a twin or full). All that's left, are your own personal finishing touches- like art. 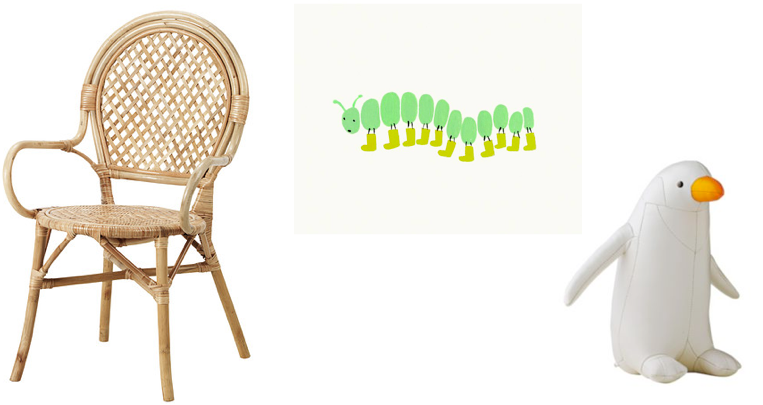 How cute is the caterpillar print from Waiting on Martha? I also love this animal parade print. I'll admit that I am a reapeat offender with emoji's. It's B-A-D. Naturally, I get such a kick (I'm punny) out of this collaboration by Del Torro and Edie Parker. If you know me in real life It's easy to spot my favorite... #QUEENBEE all the way (an insider reference to my affinity for my previous job). What's your favorite? Would you sport these? I love my Stubbs & Wooten and wouldn't mind adding a pair of these to my closet. 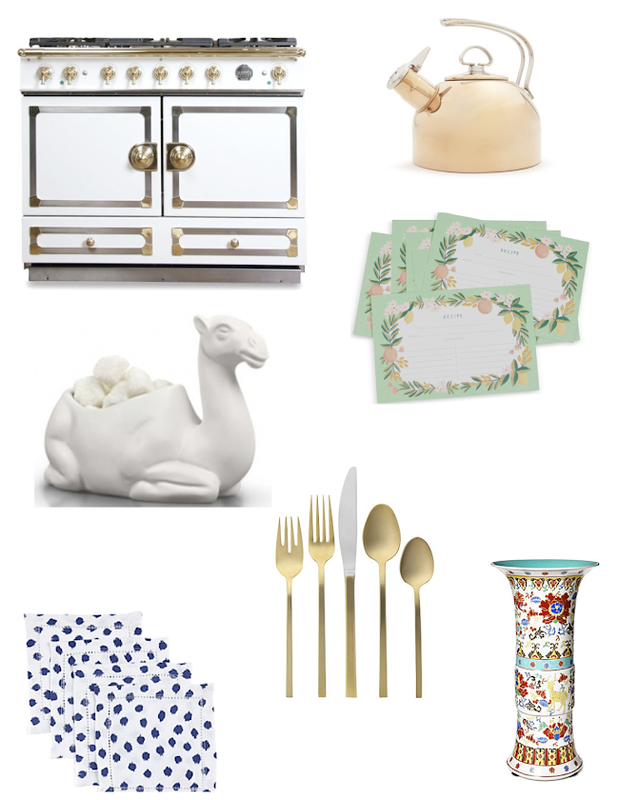 Can we just discuss the ridiculous sale going on now over at C.Wonder? Forty percent off of everything! 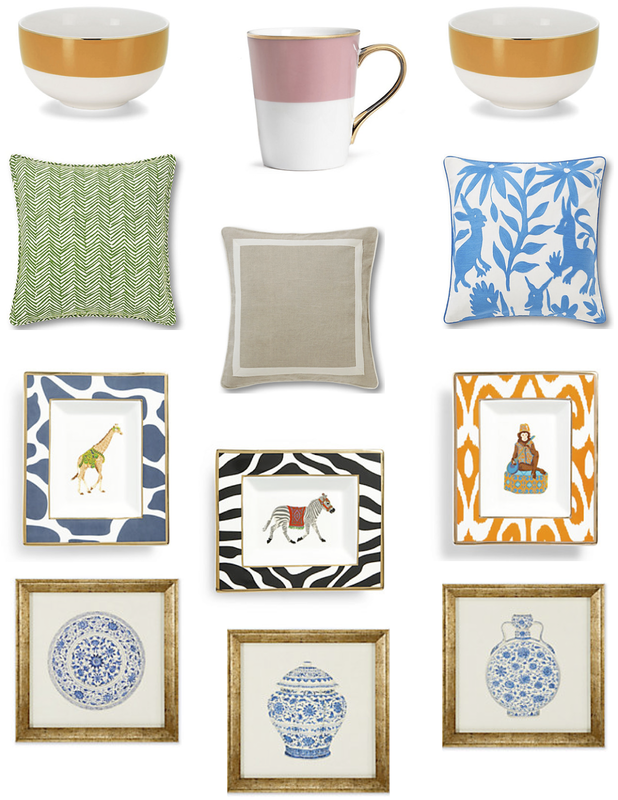 Above I displayed my picks for the home and tabletop but you can also shop jewelry, clothing, and accessories. I'm seriously considering a set of four framed Chinoiserie prints (shown above) for a bare wall in my living room. Head on over now and snag something great! Would love to know what you scoop up! 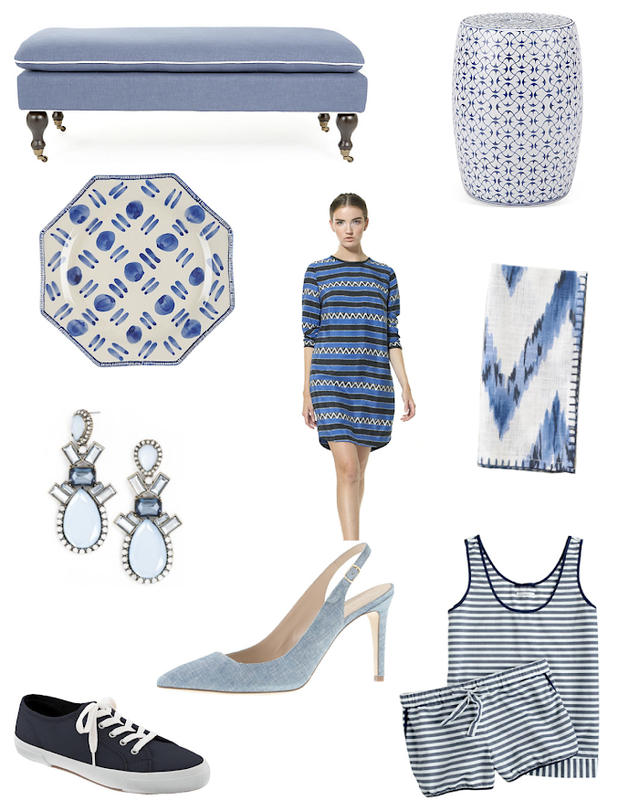 I'm drawn to color and wanted to put together an inspiration board that highlights a few pieces I'm currently coveting. 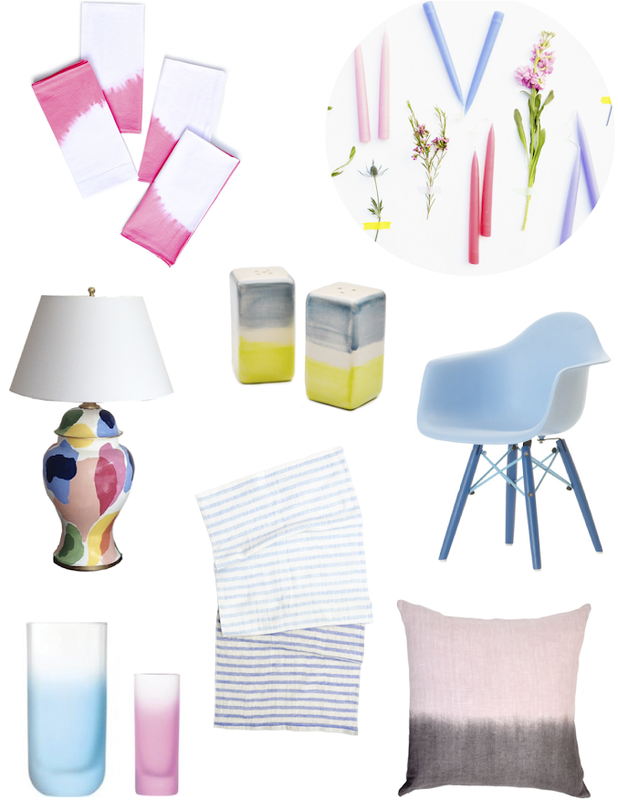 I love how many of the above items feature a watercolor, ombre, or tie dye effect. 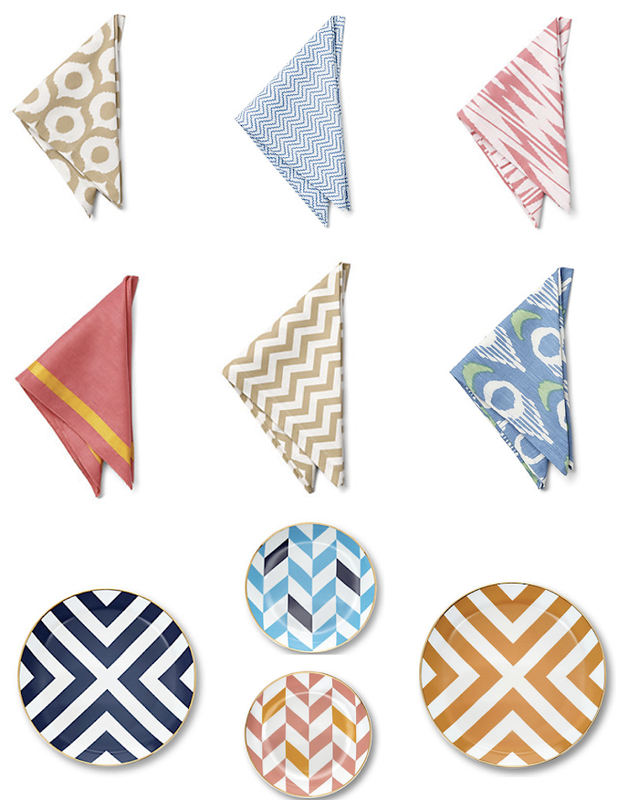 I just purchased the dip dye napkins on the top left from a store in Maine and was excited to find them online in other colors. I went with a dark blue to pair with my plates. I "need" the haze shot glasses in pink for my bar cart, and wish I had a spot for the lamp and bucket chair. Anything you're loving lately in design? Would love to know. I'm patiently waiting for spring to hit New England. 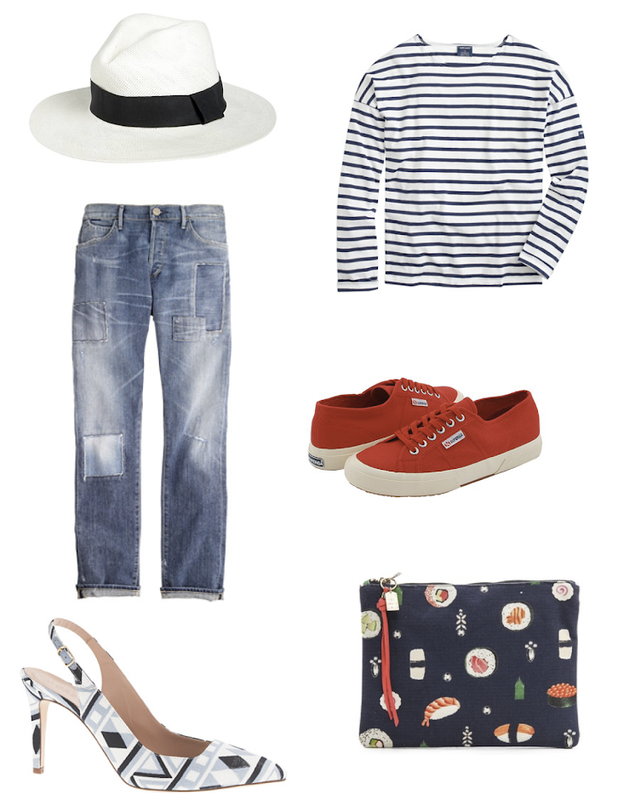 J.Crew Factory has some great little looks for warm weather and I've just added a few things to my closet (like this worn out here with O.Style). Factory is not a J.Crew outlet but rather an entirely separate manufacturing process set at a much lower price point. 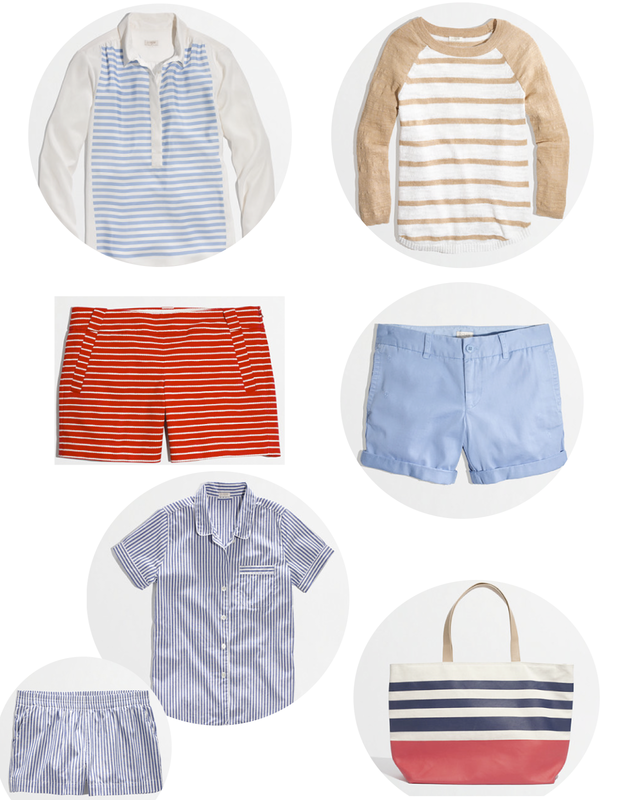 Below, I've put together a few striped tops and shorts that I would pair together as well as a fun tote and set of pajamas for summer. Admittedly, I have zero interest in cooking. 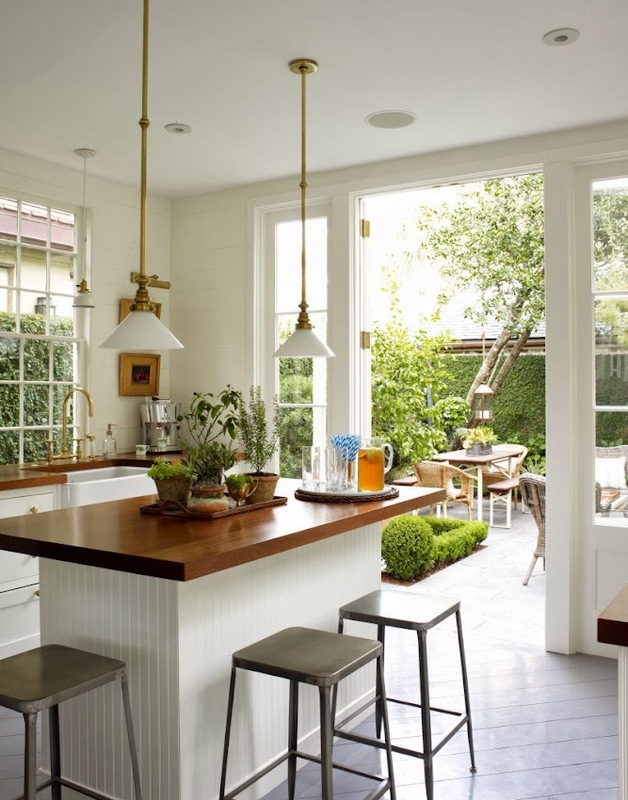 Regardless, I'm drawn to kitchens from a decorating standpoint. 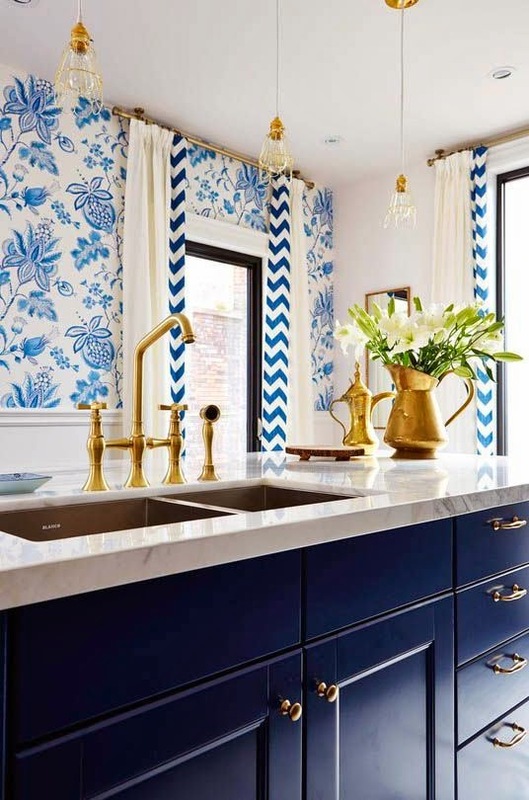 Sarah Richardson designed the above kitchen so I thought I'd throw a little board together of finishing touches picking up on the blue and brass accents. I just purchased the above pillowtop bench for the foot of my bed. The silhouette is perfect and the white piping is my favorite part. You can find it here but I snooped around and found it on sale for an even lower price here. I also have to mention the Oscar de la Renta dinner plates. My heart is set on these Italian splatter plates but they are not made in dinner size- UGH! They offer a charger and salad plate size so I actually contacted the store that carries them and am having them ask the designer in Italy if they will make a dinner plate. Is that a little psycho kitty? Perhaps, but once I have my mind set on something I don't give up too easily. I've chosen the Oscar plates as a possible back-up. I have been thinking about the idea of adding a settee to my dining area and just pulled the trigger on this coral armless version from One Kings Lane (also offered in rose). I originally thought I would place it at the foot of my bed but then became smitten with the idea of adding some coziness to my kitchen area. 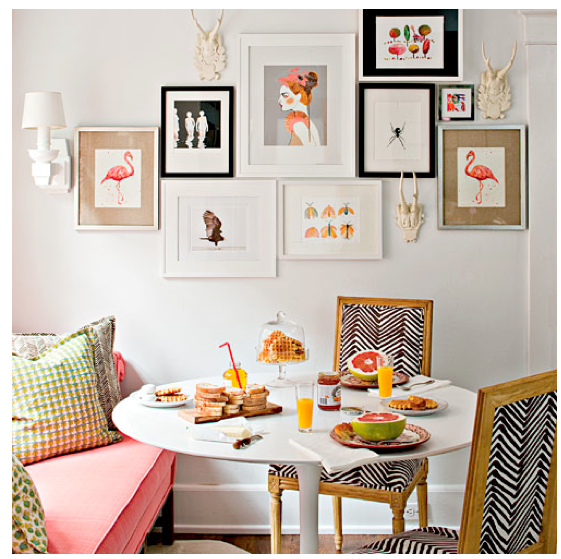 I remembered the breakfast nook of Southern Living decorating editor Lindsay Ellis Beatty and that completely sealed the deal. Shown above, Lindsay's nook and my current space have many similarities. I have a rounded white table and a gallery wall. I also have this little bar cart (purchase here) and two dining chairs. The layout will be quite similar except for her incredible windows, sconces, and drapes. Seriously can not wait for it to arrive! I can't even begin to tell you how much I adore this space. I've followed Olivia Brock of Laquered Life since the very beginning when she was off to UPenn to study Historic Preservation. Her little studio apartment was flawless and she has clearly found her passion. Currently, she resides in Charleston, South Carolina with her husband and little cavalier Hamish. Her one room wide Single House has been painstakingly restored to reflect it's original time period. 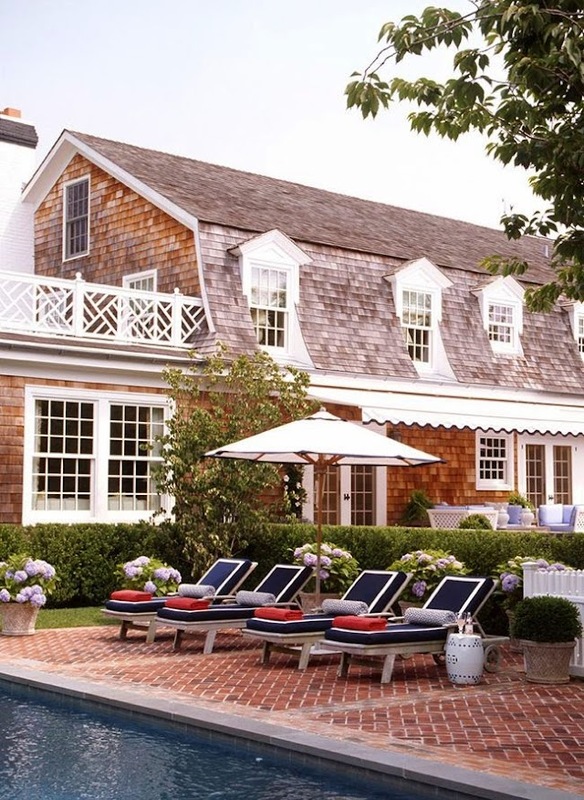 Olivia's classic home graces the pages of this month's Southern Living magazine. The lens in which Olivia views the home is fascinating. If you have a chance you really must grab a copy. The before and after pictures are incredible and I so enjoyed reading a renovation story that was about rebuilding character and authenticity rather than square feet and amenities. The above images were just shared by Olivia on her blog today (with sources). The kitchen remodel now reflects an early 20th century aesthetic. Many of the elements are appealing to me from a visual standpoint but are clearly executed for historical accuracy. Take for example the first image. 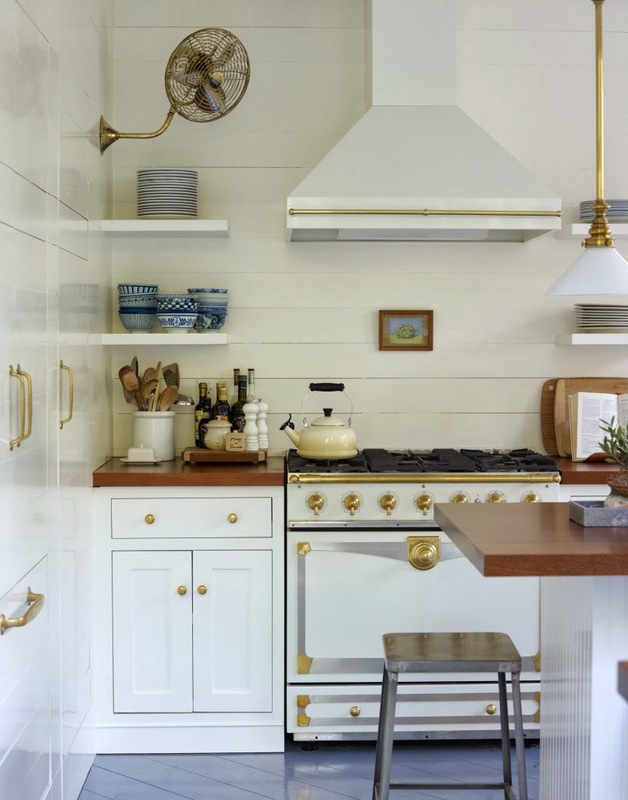 The open shelving and mahogany counter tops are in keeping with the time period. Upper cabinets were actually removed during the remodel. Nevertheless, I'm drawn to these elements simply because the design market seems to be over saturated with slab after slab of granite, marble etc. Then there's the range. Can I even begin to address the range!? 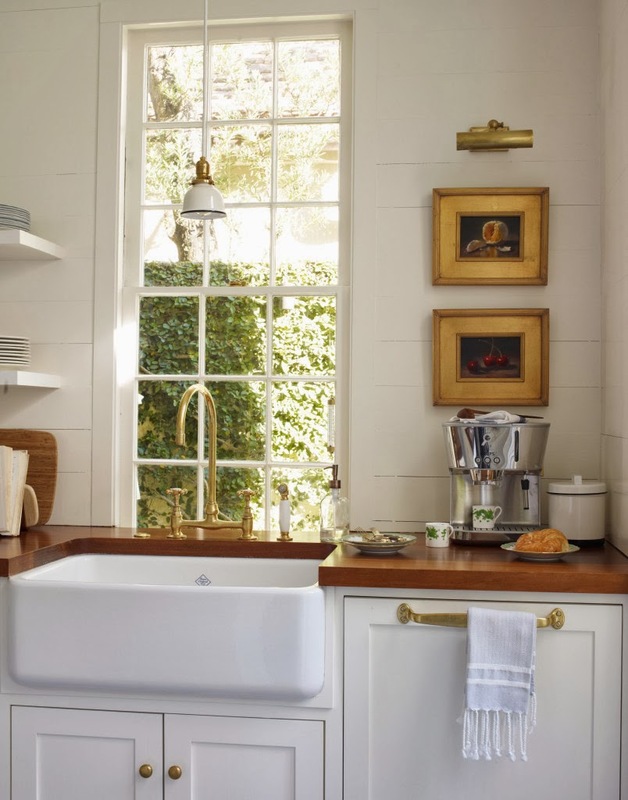 What about the pine floors laid on a diagonal and the farmhouse sink? There's so much to take in once you begin to look at the space through Olivia's eyes. You must visit her original post here. I hope there are plans to reveal more secrets from the remodel. I need the grand tour! Quick trips to visit friends are on the horizon and I have my fingers crossed that spring is on its way. I can't help but envision what I would want to pack for nights out, daytime excursions, and fun in the sun. Purchase the duffel bag here. I'm so excited to head home this weekend to visit with family and celebrate my little sister's 25th! She just got back from Paris where she celebrated the exciting milestone with a few close friends. I so admire her adventurous spirit. 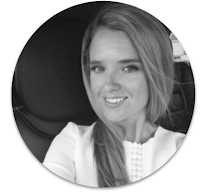 She's traveled extensively and even moved to New Zealand after college! I resolved to take a trip this year as my new years resolution and it's completely inspired by her. If you're interested, I've updated lots of items in the shop my style tab here. Also feel free to keep in touch through facebook, instagram, and twitter. 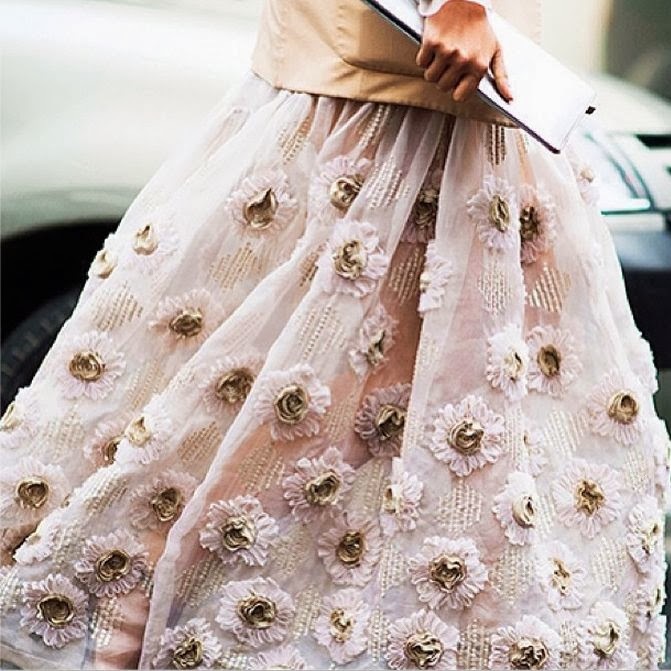 I'm a big fan of a simple ensemble that can be worn during the day or at night. Sometimes, when I'm doing a casual happy hour, or I'm just not in the mood to get gussied up I throw on a comfy jean look and swap out shoes with heels. 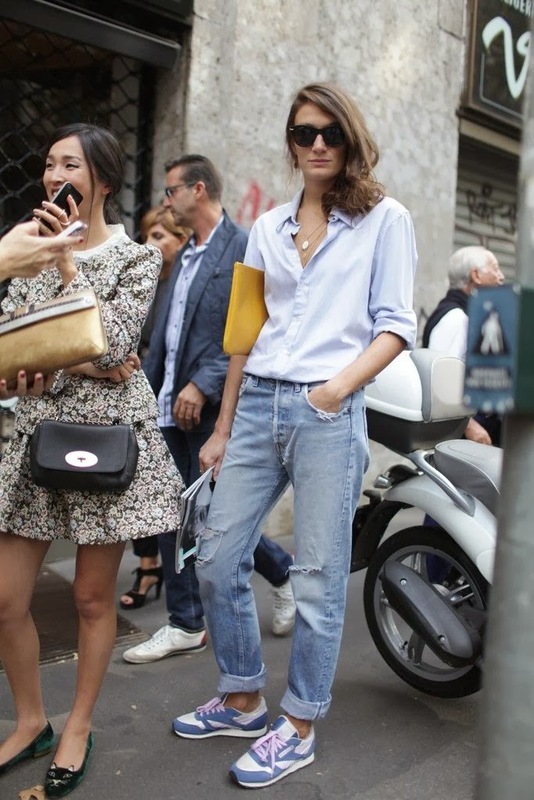 I'd wear the above look with sneaks and a cross body during the day, then ditch the hat and throw on pumps for evening. Dear warm weather. Where are you? I'm so excited that I now live right near the beach, but I seriously need to step up my swimsuit game.